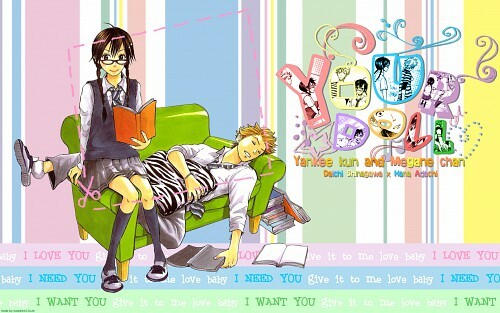 I'm so getting hooked to the Yankee-kun to Megane-chan manga. I love the simple story, the progress, and the character development. The only problem is that the scanlators are taking too long to translate the manga. But I don't mind, I can wait. The wallpaper shows Hana Adachi and Daichi Shinagawa, the two main protagonists of the story. I like their love-hate relationship and I decided to make a wallpaper as fandom for them. This wallpaper is quite challenging because its my first time of trying a simple yet pastel-colored wallpaper theme. I'm more into upbeat, vibrant and super bright wallpapers (currently in my dreams). But I like the way my wallpaper turned out. The wallpaper is inspired (and named) from the song "Your Doll" sung by Sunny of SNSD/Girl's Generation. This song is very catchy. I was listening to this one song while reading the whole series. Personally, the song fits with Hana and Daichi's current relationship situation. The bg is actually from this one. The "Yankee kun and Megane chan" title color is from this one (the color corresponds to the original Japanese characters shown on the scan). Wow, what a pretty wallpaper! Love the colors and details you made! It looks great.